So, you want to find some trends? Maybe you’re looking to start a new website on a trending topic, or looking to spot trends within an existing market, but either way, you’re interested in knowing what’s hot, what’s not, and what people are most interested in right now. What is internet marketing after all, if it isn’t about putting your solutions in front of those who really need them and want them? Welcome to the fascinating world of trendspotting! Now, instead of just presenting a bunch of theory or principles, I’d like to give you some quick and easy, step-by-step plans for how the “Average Joe” can uncover and capitalize on trends. These steps can be followed no matter what market you intend to research. And they’re the same steps we’ve personally used for years when we wanted to locate trends using simple, manual searches, before breakthrough trendspotting tools like TrendMiner Pro were developed. It doesn’t matter whether you’re looking for trends in baseball, cooking, hockey, or medicine…every market has trends that can be discovered and profited from. All you need to do at this point is determine what market(s) you’re interested in hunting for trends. If you’re merely looking to find the hottest trends in any market, I recommend you go straight to Google Trends and use their helpful categories feature. Unlike other research tools that Google provides, you don’t need to even input a seed keyword in order to get back great results. Just toggle through each category, without placing in any keywords, and see if any of the trending results returned interest you. Want to speed up this “trend brainstorming process”? In TrendMiner Pro you can tap into the same powerful database of billions of searches, but do advanced searching like Drill Deep and Top Searches to uncover even more trends faster. If you’re not already at Google Trends from the previous step, you’ll want to head over there now. Now we’re going to tap into the massive Google database of trend data directly. Remember, Google has a 70% market share of all searches online, so they have a great pulse on every market. For our example, I’m going to be using the term “Legos” (children’s building toy). By default, Google brings back results based on Web Searches, Worldwide, 2004-present, All Categories. You can modify these settings using the drop down boxes, and you should definitely do this if you’re a local business looking to find trends only in specific regions or areas. Note: Changing any of these settings will modify the source data, so the trends will be different depending on these settings. If your search was successful, you should now be looking at lots of trend data related to your topic or market keyword. 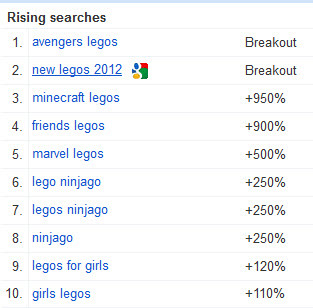 Locate the “Rising Searches” section in the lower left hand corner. 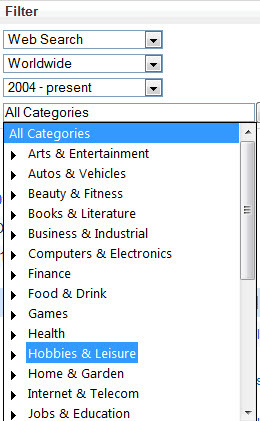 By default, this section represents the latest trend data using your search settings. Open up a text editor or grab a piece of paper and a pencil. Divide your paper into two columns, or create two lists in the text file you have in front of you. In one column, you’re going to place the Rising Search terms, with their trend percentages, and in the other column, just jot down the Top Searched terms (right side panel). Now we’re going to do something that most researchers overlook. We’re going to dig within these trends and top searches to uncover trends within trends. Remember that list you made in step 3? Just take those terms and place them into Google Insights to search within those trends. 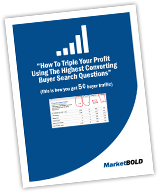 Make sure to record the Top Search terms and Rising Searches for the results from this process. Once you’ve completed that, you’ll have a big list of trend terms and the percentage of increased search volume (the search trend) to use in the next steps. Note: If you want to speed things up dramatically, TrendMiner Pro can automatically get this data in seconds from Google Insights and also perform the Drill Deep and Top Searches process in a single click. All results are then placed in a table for you to copy or export and work with instantly! Google Trends reveals trend data based on Broad matches. In order to get more specific trend data on any keyword, we’ll need to use another great Google research tool, the Google Adwords Keyword Planner. In order to get the trend data that we need, you’ll have to be signed into the Google Adwords Keyword Planner (GKP). You can open a free account if you don’t have one already. Once signed in, just place in a single trend term, or a list of terms that you recorded in an earlier step. (If you’re using TrendMiner Pro, you can simply paste in the keywords directly from the application or the saved .csv file. Now, you simply need to pay close attention to the Local Search Trends column. Google has made it easy to visually see if a search trend is steadily going up, month after month, or just has spikes from time to time. In some cases, you may see some of the suggested trends show a decline over the last 12 months. That’s ok. Remember, Trends delivered you trend data based on BROAD match, and you’re now looking at trend data based on EXACT match, which is often the cause of the trend discrepancy. In any case, you want to keep an eye out for terms that have a decent amount of search volume, and show a recent (or steady) increase in search volume (trending up). Now that you’ve made it this far (hooray for you!) 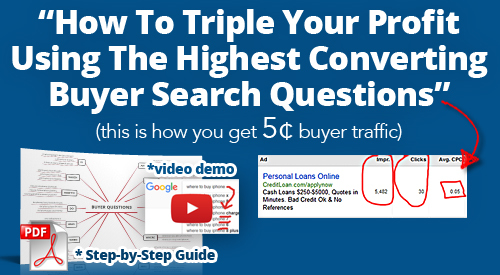 you simply need to take the hottest trends that you’ve uncovered during your research, and write down the term, search volume and possibly record the Approximate CPC value. This is the best part…and the most exciting! Remember, just one hot trend can be very profitable…if you get in early enough and quick enough to capture the lion’s share of the search volume. Depending on whether you plan to build a new website, create a series of blog posts, create a new product, or setup an advertising campaign largely determines what your next steps will be. One final optional step is to search social media sites for your trending terms to verify that other properties (Twitter, Facebook, Pinterest, LinkedIn, etc.) are also showing recent entries where the search term trend can be seen. This is a precautionary step, but a good one to take if you think the Google data may be an anomaly. Want to speed this process up 10x?